The adzuki, or red, bean is small and reddish-brown and has a nutty-sweet flavour. It probably originated in China and is currently primarily imported from China and Thailand, where the bean is harvested in November and December. In Asia, adzuki beans are usually cooked to a soft consistency. They are served with coconut milk or cooked with rice, their bright colour tinting the rice an attractive pink. It is also common to find adzuki beans sweetened with sugar and made into cakes and sweetmeats. Adzuki beans are used in many Asian desserts. Although I have eaten adzuki bean ice cream, I have never made it myself, until recently that is. For my first attempt, I used store bought sweetened red bean paste. The result was an ice cream that had flavour but lacked texture. I think that the texture of bean is what makes red bean ice cream special. It is the combination of red bean texture and sweet nutty flavour that is comforting. My second attempt involved making sweetened adzuki beans. I then added a cup of the sweet beans to my ice cream base. Unfortunately, the colour and flavour were weak, and there was now too much texture. During my third and final attempt, I added two cups of sweetened adzuki bean to the ice cream base and blended the mixture in a food processor. This technique created an adzuki bean ice cream with colour, taste and just enough texture. I served the ice cream with whipped cream, which compliments its flavour and texture. I highly recommend that you try adzuki bean ice cream. 1. Place beans in a bowl of water and soak overnight. 2. Drain beans and rinse well. Put the beans in a saucepan and add water to cover. Bring to a boil and drain. Return to the saucepan and add water to cover the beans by 1 cm. Bring to a boil and simmer, skimming any scum from the surface. Continue to simmer until beans are soft, about 30 minutes. 3. Add sugar, stirring to dissolve. Then bring to a boil. Reduce heat to low and simmer covered, stirring frequently, until beans thicken, at least another 30 minutes. It is very important to stir beans frequently as sugar can cause mixture to stick to the bottom of the pan. Remove from heat, add pinch of salt and stir well. Let cool. 1. Place heavy cream, whole milk and 1/3 cup of sugar in a small saucepan. Bring to a rolling boil over medium-high heat, stirring occasionally. 2. In a small bowl, whisk the remaining 1/3 cup of sugar with the egg yolks until well mixed. Temper the egg yolk mixture with 1/2 cup of the hot cream mixture. 3. Once tempered, add the rest of the egg mixture into the cream mixture and bring mixture up to 85ºC or until it coats the back of a wooden spoon. 4. Let the mixture cool and then add the 2 cups of adzuki beans. Let the mixture sit in the refrigerator over night or until completely cool, at least four hours. 5. 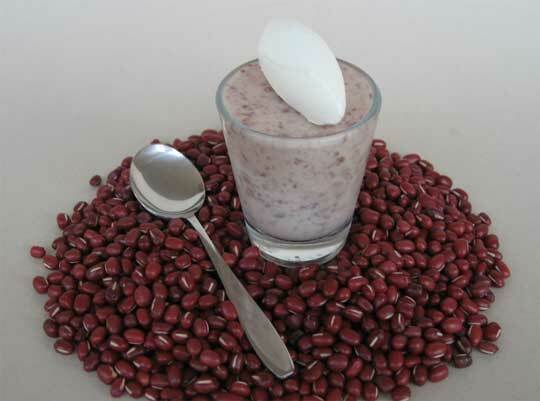 Blend the adzuki bean ice cream mixture in a blender or food processor. Once processed, the adzuki bean ice cream mixture is ready to be spun in an ice cream maker. 6. Process in an ice cream maker according to the manufacturer’s directions. Posted by Sam at 9:43 p.m. Thanks so much for these recipes! Adzuki beans are so good for you, I think this will cancel out the badness of the icecream! What an interesting recipe. Thanks for sharing. I made an Elderflower Sorbet for your summer-ice-cream-event. An intriguing thought! But I am of the mind that ice cream is just good. Thanks for visting! Thanks for your comment and thanks again for particpating in the ice cream event, your sorbet looks wonderful. I had red bean ice cream in a Japanese restaurant a couple of months ago and I loved it, I'm going to try this recipe!!!! Thank you! You said you added red bean paste? You didn't include that in your ingredients list or where you add it into the mix - can you please clarify how much you add and when you add it? You never mentioned how much of the red bean paste to add - or wheere to add it! Can you please clarify?